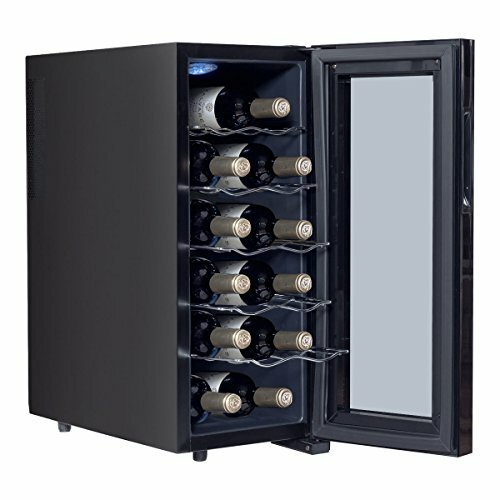 This is our brand new and professional 6 bottles Thermoelectric wine cooler, which is perfect for storing your favorite wine bottles in a dependable climate-controlled space. Made with compactness and Energy efficiency in mind, this wine cooler is equipped with a sleek black cabinet and a glass see-through door. It can be used in a small apartment, kitchen, home bar, entertainment or dining area. Thermoelectric technology allows you to easily serve your friends, family and guests with this cooler whenever you like. Color: Black / Overall dimension: 20.1"L x9.8"W x 24.0"H / Voltage: 110V-120V/60Hz / Input power:50W / Capacity: 1.2Cu.Ft.